Everyone thinks they know about rabbits. Cute. Fluffy. Nose that twitches. Hop a bit. Long ears. Eat carrots. Pretty simple really. Rabbits. They might look simple but they are anything but! Rabbits are complex, social creatures. They can make great pets, but ONLY if you look after them properly and understand what they need! There is a lot going on behind those whiskers! 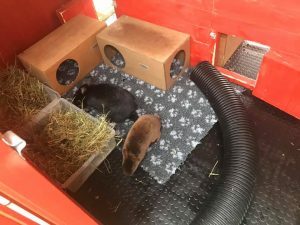 When it comes to their health, the VAST majority of problems are linked to a poor diet, so it is super important to ensure that your bunnies are eating only the best! 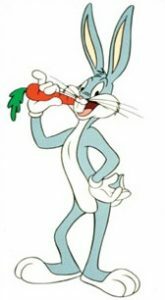 Carrots are actually pretty bad for them – Bugs Bunny is NOT a good role model for his species! Bugs Bunny. He was smart but his diet choices were not! 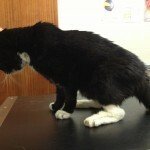 One extremely serious health problem that can develop if your bun has a poor diet is a condition called ‘Gut Stasis’. This can develop for a few different reasons but is often linked to them eating the wrong food. Specifically not enough fibre and poor quality hay. Other causes include pain (often from over-grown teeth which are also due to a bad diet), stress and dehydration. Rabbits are essentially a gastrointestinal system on legs. The guts have to be going all the time, and if they slow down or stop, so does the bunny. This is why it is so important your rabbit is constantly nibbling, and constantly pooing! If they don’t eat enough, or eat the wrong food, there isn’t enough fibre in the guts to stimulate them to churn so they slow down. This reduces the rabbits appetite so they eat less, which in turn slows the gut motility further. This vicious cycle will continue until the intestines halt completely and it can be extremely difficult to get them going again. As the guts begin to slow, the food already inside them stops being digested and starts to ferment. This produces lots of gas and which is very painful. And who wants to eat if they have a horrible stomach ache? Also, the semi-digested food will begin to dry out and harden, so even if peristalsis restarts, the system is effectively trying to shift lumps of concrete. 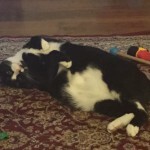 But, as the deadly trifecta of reduced movement, bloat and hardened food is developing, your rabbit will show hardly any signs they are poorly. Unfortunately many come to the vet until they are close to death’s burrow and often we cannot save them. Signs of gut stasis include a reduced appetite or refusing food, not producing a normal quantity of pellets or just not being ‘right’. When you know your rabbit well, you can tell when they aren’t quite themselves and, while you might wait a while with other pets like cats or dogs, with rabbits it is vital you act on your instincts and get them to the vet straight away! Treatment needs to be aggressive and fast. 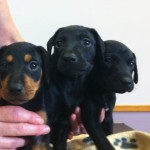 In mild cases you may be able to take them home but often your vet will admit your pet for medicine, fluids and tests. So, for gut stasis, prevention is very definitely better than cure! To help prevent gut stasis in your rabbits you need to give them the very best lifestyle and diet possible. For starters, did you know that every day a rabbit needs to eat a pile of hay as big as they are?! The tough, fibrous nature of hay is vital for healthy gut function and also keeps the teeth in check. 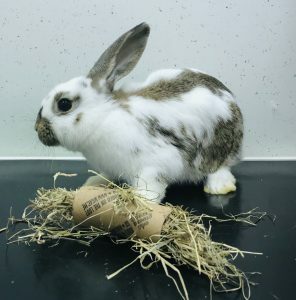 There should always be hay available for your rabbit to nibble on and you can make it more interesting by stuffing it into a hay toy (or even a toilet roll with holes cut into it! ), or scattering pellets or herbs in it. Toys don’t have to be expensive! Stuffing a toilet roll with hay gives them entertainment and encourages a good diet! As important as the quantity of hay, is the quality. Great quality hay will not only be tastier, meaning they are likely to eat lots of it, but it is also much more nutritious. 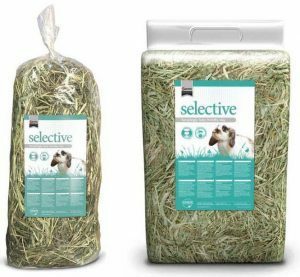 Unlimited quantities for great quality hay is vital for good gut health! The same goes for their hard food. 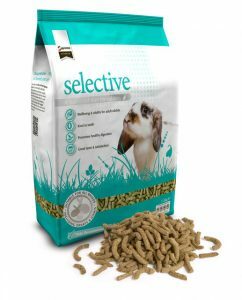 A great quality pellet diet is not only excellent for their general health, they will also often contain pre-biotics for good gut function, thus helping to prevent gut stasis! Small quantities of great quality hard food will help keep your bun in the best possible health! 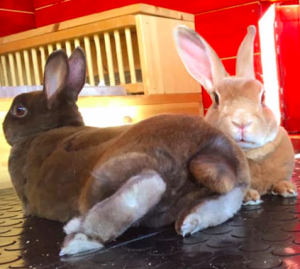 Finally, one often overlooked aspect to keeping your bun in the best condition is to give them the room to be active! Not only does this keep them fit and is great for their mental health but as they hop, jumpy and binky about, it keeps the guts churning! The very minimum size for a rabbit run is 8ft square and they should be able to stand up straight on their backlegs. Even better, why not rabbit proof your garden?! 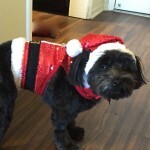 Don’t forget to give them lots of toys, tunnels to hide in and boxes to jump on and off. Being a rabbit should be fun! Not boring! Giving your rabbit lots to do and room to exercise, inside and out, will keep them active AND healthy! So there you have it, gut stasis is a killer for our rabbits but it is often a preventable condition. Remember – lots of hay and space to play – helps to keep gut stasis at bay! ← My Pet Doesn’t Have Worms! !